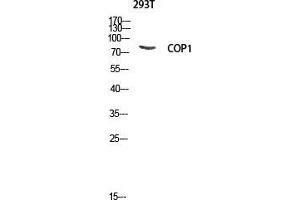 Western Blot (WB) analysis of 293T lysis using COP1 antibody. Specificity COP1 Polyclonal Antibody detects endogenous levels of COP1 protein. Characteristics Rabbit Polyclonal to COP1. Immunogen Synthesized peptide derived from human COP1 around the non-phosphorylation site of S387.